Russian media appeared to threaten Europe and the world by saying that a new nuclear torpedo could create towering tsunami waves and destroy vast swaths of Earth’s population. A Russian professor told a Russian paper that the new torpedo could create waves 1,300 to 1,600 feet high and wipe out all life nearly 1,000 miles inland with an alleged 200-megaton nuclear warhead. The US has no defenses against such a weapon. Russia and its media often overstate the capability and meaning of their nuclear weapons, but Russia really did build this new nuclear weapon, which suggests they take the hype seriously. Russian media appeared to threaten Europe and the world with an article in MK.ru, saying that a new nuclear torpedo could create towering tsunami waves and destroy vast swaths of Earth’s population. Russia’s “Poseidon” nuclear torpedo, which leaked in 2015 before being confirmed by Russian President Vladimir Putin in March 2018, represents a different kind of nuclear weapon. The US and Russia have, since the end of World War II, fought to match and exceed each other in a nuclear arms race that resulted in both countries commanding fleets of nuclear bombers, submarines, and silos of intercontinental missiles all scattered across each country. 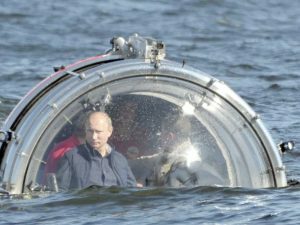 But Russia’s Poseidon takes a different course. “Russia will soon deploy an underwater nuclear-powered drone which will make the whole multi-billion dollar system of US missile defense useless,” MK.ru said, according to a BBC translation, making reference to the missile shield the US is building over Europe. “An explosion of the drone’s nuclear warhead will create a wave of between 400-500 (1,300-16,00 feet) meters high, capable of washing away all living things 1,500 (932) kilometers inland,” the newspaper added. Previously, scientists told Business Insider that Russia’s Poseidon nuke could create tsunami-sized waves, but pegged the estimate at only 100-meter-high (330 feet) waves. While all nuclear weapons pose a tremendous threat to human life on Earth because of their outright destructive power and ability to spread harmful radiation, the Poseidon has unique world-ending qualities. The US designed its nuclear weapons to detonate in the air above a target, providing downward pressure. The US’ nuclear weapons today have mainly been designed to fire on and destroy Russian nuclear weapons that sit in their silos, rather than to target cities and end human life. But detonating the bomb in an ocean not only could cause tsunami waves that would indiscriminately wreak havoc on an entire continent, but it would also increase the radioactive fallout. Russia’s Poseidon missile is rumored to have a coating of cobalt metal, which Stephen Schwartz, an expert on nuclear history, said would “vaporize, condense, and then fall back to earth tens, hundreds, or thousands of miles from the site of the explosion.” Potentially, the weapon would render thousands of square miles of Earth’s surface unlivable for decades. “It’s an insane weapon in the sense that it’s probably as indiscriminate and lethal as you can make a nuclear weapon,” Hans Kristensen, the director of the Nuclear Information Project at the Federation of American Scientists, told Business Insider. Can Russia take over the world with this weapon? No. MK.ru quoted a professor as saying the Poseidon will make Russia a “world dictator” and that it could be used to threaten Europe. “If Europe will behave badly, just send a mini-nuclear powered submarine there with a 200-megaton bomb on board, put it in the southern part of the North Sea, and ‘let rip’ when we need to. What will be left of Europe?” the professor asked. While the Russian professor may have overstated the importance of the Poseidon, as Russia already has the nuclear firepower to destroy much of the world and still struggles to achieve its foreign-policy goals, the paper correctly said that the US has no countermeasures in place against the new weapon. US missile defenses against ballistic missiles have only enough interceptors on hand to defend against a small salvo of weapons from a small nuclear power like North Korea or Iran. Also, they must be fired in ballistic trajectories. But the US has nuclear weapons of its own that would survive Russia’s attack. Even if Russia somehow managed to make the whole continent of Europe or North America go dark, submarines on deterrence patrols would return fire and pound Russia from secret locations at the bottom of the ocean. Russia’s media, especially MK. Ru, often use hyperbole that overstates the country’s nuclear capabilities and willingness to fight. But with the Poseidon missile, which appears custom-built to end life on Earth, Russia has shown it actually does favor spectacularly dangerous nuclear weapons as a means of trying to bully other countries.